Executors framework (java.util.concurrent.Executor), released with the JDK 5 in package java.util.concurrent is used to run the Runnable objects without creating new threads every time and mostly re-using the already created threads. The Executor framework is an abstraction layer over the actual implementation of java multithreading. It is the first concurrent utility framework in java and used for standardizing invocation, scheduling, execution and control of asynchronous tasks in parallel threads. The execution rules are defined during the creation of the constructor. And then the executor runs the concurrent threads following the rules set earlier. The Java Executor framework provides multi-threading applications an easy abstraction layer. The executor abstraction layer hides the critical parts of concurrent execution and the programmer only concentrates on the business logic implementation. In java executor framework all parallel works are considered as tasks instead of simple threads. So the application now deals simply with instances of Runnable (which is basically collections of tasks or parallel works) and then it is passed to an Executor to process. The ExecutorServiceinterface extends the simplistic Executor interface. The Java Executor framework has life cycle methods to manage the entire concurrent execution flow. The FutureTask class is another important component which is used to get future information about the processing. An instance of this class can wrap either a Callable or a Runnable. You can get an instance of this as the return value of submit () method of anExecutorService. You can also manually wrap your task in a FutureTask before calling execute () method. This approach creates a thread pool that creates new threads as needed, but will reuse previously constructed threads when they are available. These pools will typically improve the performance of programs that execute many short-lived asynchronous tasks. If no existing thread is available, a new thread will be created and added to the pool. Threads that have not been used for 60 seconds are terminated and removed from the cache. This approach creates a thread pool that reuses a fixed number of threads. Created nThreads will be active at the runtime. If additional tasks are submitted when all threads are active, they will wait in the queue until a thread is available. This approach creates an Executor that uses a single worker thread operating off an unbounded queue. Tasks are guaranteed to execute sequentially, and no more than one task will be active at any given time. SimpleTask uing Runnable: Executing Logic…! 1) Use of Thread Pool reduces response time by avoiding thread creation during request or task processing. 2) Use of Thread Pool allows you to change your execution policy as you need. you can go from single thread to multiple threads by just replacing ExecutorService implementation. 3) Thread Pool in Java application increases the stability of the system by creating a configured number of threads decided based on system load and available resource. 4) Thread Pool frees application developer from thread management stuff and allows to focus on business logic. Java Concurrency interview question– In year 2004 when technology gurus said innovation in Java is gone down and Sun Microsystems [Now Oracle] came with the Tiger release with very important changes with in java 1.5 and most important feature was Concurrency and programming features. This is hot topic for java interviews from past few years. Interviewers are mainly focused on java 1.5 concurrent package and they can ask how to use these changes and what are the benefits. They will focus on how concurrency is better than synchronisation and how executors are better than old java thread implementation? How you can avoid locks ? and What is java memory model changes for volatile etc. In investment banks we need to work on multithreaded applications due to high volume so clear understanding of this topic is very important. This topic is key for clearing any core java interview. Most of these features are implemented in the new java.util.concurrent packages. There are also new concurrent data structures in the Java Collections Framework. Lock objects support locking idioms that simplify many concurrent applications. Executors define a high-level API for launching and managing threads. Executor implementations provided by java.util.concurrent provide thread pool management suitable for large-scale applications. Concurrent collections make it easier to manage large collections of data, and can greatly reduce the need for synchronization. Atomic variables have features that minimize synchronization and help avoid memory consistency errors. ThreadLocalRandom (in JDK 7) provides efficient generation of pseudorandom numbers from multiple threads. What is Synchronized Methods ? The Java programming language provides two basic synchronization idioms: synchronized methods and synchronized statements. The more complex of the two, synchronized statements, are described in the next section. This section is about synchronized methods. Note that constructors cannot be synchronized — using the synchronized keyword with a constructor is a syntax error. Synchronizing constructorsdoesn’t make sense, because only the thread that creates an object should have access to it while it is being constructed. What is Intrinsic Locks and Synchronization ? Synchronization is built around an internal entity known as the intrinsic lock or monitor lock. (The API specification often refers to this entity simply as a “monitor.”) Intrinsic locks play a role in both aspects of synchronization: enforcing exclusive access to an object’s state and establishing happens-before relationships that are essential to visibility. Every object has an intrinsic lock associated with it. By convention, a thread that needs exclusive and consistent access to an object’s fields has to acquire the object’s intrinsic lock before accessing them, and then release the intrinsic lock when it’s done with them. A thread is said to own the intrinsic lock between the time it has acquired the lock and released the lock. As long as a thread owns an intrinsic lock, no other thread can acquire the same lock. The other thread will block when it attempts to acquire the lock. What is Reentrant Synchronization ? Deadlock describes a situation where two or more threads are blocked forever, waiting for each other. In below example method m1 and m2 both are taking lock of Integer and String class in different order and blocking each other for ever. This deadlock can be solved by putting same order of lock for Integer and String class in method m1 and m2. What is Starvation and Livelock ? What is Immutable Objects ? An object is considered immutable if its state cannot change after it is constructed. Maximum reliance on immutable objects is widely accepted as a sound strategy for creating simple, reliable code. Immutable objects are particularly useful in concurrent applications. Since they cannot change state, they cannot be corrupted by thread interference or observed in an inconsistent state. Programmers are often reluctant to employ immutable objects, because they worry about the cost of creating a new object as opposed to updating an object in place. The impact of object creation is often overestimated, and can be offset by some of the efficiencies associated with immutable objects. These include decreased overhead due to garbage collection, and the elimination of code needed to protect mutable objects from corruption. The following subsections take a class whose instances are mutable and derives a class with immutable instances from it. In so doing, they give general rules for this kind of conversion and demonstrate some of the advantages of immutable objects. What should be Strategy for Defining Immutable Objects ? The following rules define a simple strategy for creating immutable objects. Not all classes documented as “immutable” follow these rules. This does not necessarily mean the creators of these classes were sloppy — they may have good reason for believing that instances of their classes never change after construction. However, such strategies require sophisticated analysis and are not for beginners. Don’t provide “setter” methods — methods that modify fields or objects referred to by fields. Don’t allow subclasses to override methods. The simplest way to do this is to declare the class as final. A more sophisticated approach is to make the constructor private and construct instances in factory methods. Don’t provide methods that modify the mutable objects. Don’t share references to the mutable objects. Never store references to external, mutable objects passed to the constructor; if necessary, create copies, and store references to the copies. Similarly, create copies of your internal mutable objects when necessary to avoid returning the originals in your methods. What are High Level Concurrency Objects ? So far, this we have focused on the low-level APIs that have been part of the Java platform from the very beginning. These APIs are adequate for very basic tasks, but higher-level building blocks are needed for more advanced tasks. This is especially true for massively concurrent applications that fully exploit today’s multiprocessor and multi-core systems. In this section we’ll look at some of the high-level concurrency features introduced with version 5.0 of the Java platform. Most of these features are implemented in the new java.util.concurrent packages. There are also new concurrent data structures in the Java Collections Framework. In large-scale applications, it makes sense to separate thread management and creation from the rest of the application. Objects that encapsulate these functions are known as executors. The following subsections describe executors in detail. Executor Interfaces define the three executor object types. 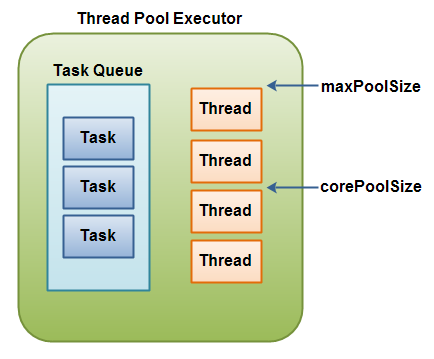 Thread Pools are the most common kind of executor implementation. Fork/Join is a framework (new in JDK 7) for taking advantage of multiple processors. Executor, a simple interface that supports launching new tasks. ExecutorService, a subinterface of Executor, which adds features that help manage the lifecycle, both of the individual tasks and of the executor itself. ScheduledExecutorService, a subinterface of ExecutorService, supports future and/or periodic execution of tasks. Typically, variables that refer to executor objects are declared as one of these three interface types, not with an executor class type. Below is the example of ExecutorService using cachedThreadPool. This is using Callable instance, which does the task and return the result to calling programme. What is Thread Pools ? Most of the executor implementations in java.util.concurrent use thread pools, which consist of worker threads. This kind of thread exists separately from the Runnable and Callable tasks it executes and is often used to execute multiple tasks.Using worker threads minimizes the overhead due to thread creation. Thread objects use a significant amount of memory, and in a large-scale application, allocating and deallocating many thread objects creates a significant memory management overhead.One common type of thread pool is the fixed thread pool. This type of pool always has a specified number of threads running; if a thread is somehow terminated while it is still in use, it is automatically replaced with a new thread. Tasks are submitted to the pool via an internal queue, which holds extra tasks whenever there are more active tasks than threads. New in the Java SE 7 release, the fork/join framework is an implementation of the ExecutorService interface that helps you take advantage of multiple processors. It is designed for work that can be broken into smaller pieces recursively. The goal is to use all the available processing power to make your application wicked fast. As with any ExecutorService, the fork/join framework distributes tasks to worker threads in a thread pool. The fork/join framework is distinct because it uses a work-stealing algorithm. Worker threads that run out of things to do can steal tasks from other threads that are still busy. The center of the fork/join framework is the ForkJoinPool class, an extension of AbstractExecutorService. ForkJoinPool implements the core work-stealing algorithm and can execute ForkJoinTasks. Wrap this code as a ForkJoinTask subclass, typically as one of its more specialized types RecursiveTask(which can return a result) or RecursiveAction. After your ForkJoinTask is ready, create one that represents all the work to be done and pass it to the invoke() method of a ForkJoinPool instance. What is Concurrent Collections ? BlockingQueue defines a first-in-first-out data structure that blocks or times out when you attempt to add to a full queue, or retrieve from an empty queue. ConcurrentMap is a subinterface of java.util.Map that defines useful atomic operations. These operations remove or replace a key-value pair only if the key is present, or add a key-value pair only if the key is absent. Making these operations atomic helps avoid synchronization. The standard general-purpose implementation of ConcurrentMap is ConcurrentHashMap, which is a concurrent analog of HashMap. ConcurrentNavigableMap is a subinterface of ConcurrentMap that supports approximate matches. The standard general-purpose implementation of ConcurrentNavigableMap is ConcurrentSkipListMap, which is a concurrent analog of TreeMap. All of these collections help avoid Memory Consistency Errors by defining a happens-before relationship between an operation that adds an object to the collection with subsequent operations that access or remove that object. Can you pass a Thread object to Executor.execute? Would such an invocation make sense? Why or why not ? Thread implements the Runnable interface, so you can pass an instance of Thread to Executor.execute. However it doesn’t make sense to use Thread objects this way. If the object is directly instantiated from Thread, its run method doesn’t do anything. You can define a subclass of Thread with a useful run method — but such a class would implement features that the executor would not use. TechnicalStack © 2016. All Rights Reserved.